A close friend recommended Rob and I am so pleased that she did! Highly professional and knowledgeable, Rob works extremely hard for you. He is quite practical, gives helpful advice, and is a relentless champion for you. I have had some realtors in the past who seemed to have their own agenda and who did not inspire confidence. Integrity, honesty, hard working, and highly experienced - I would work with Rob again in a heartbeat. Every Realtor wants your business and you would expect them to go the extra mile to earn it. Rob did exactly that! When we moved from Alberta to West Kelowna with very little notice and a limited time frame to find a house Rob jumped to the challenge. Rob listened to our needs, provided us with houses to view before we had a chance to physically come to West Kelowna and gave us his undivided attention to find a home in the 3 days we had to look. We found our dream home and are happily settled here now. I think it’s important to note that Rob provided us with insight about neighbourhoods, statistics and travel times while not providing his own personal opinion. I have found in the past that realtors like to give their personal feelings about things that clouded our judgement and Rob simply provided the facts and listened quietly while we digested the information to make our own decision. He even returned to the home 2 weeks after we moved in to help clean out the compost bins and pet waste left behind by the previous owners in the back yard! Now that’s some crazy over the top help. I wanted to thank you for all that you have done for me over the past year! You have made the process of buying and selling a home wonderful. Your consideration for me personally, your listening skills, positive professional manner and your strong knowledge of the current market trends are really outstanding. I would recommend you to anyone wanting to buy or sell - Rob, you truly are fabulous and I wish you continued success. 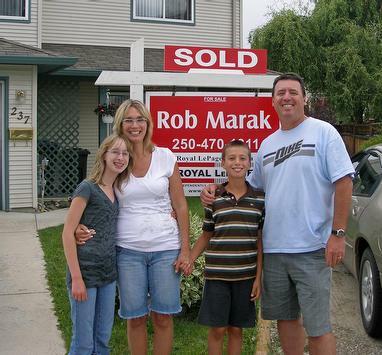 My wife and I would like to thank Rob Marak for representing our interests when selling our Kelowna home. A chance meeting some ten years ago made the decision to list our property with Rob the natural decision. We considered listing our property in 2010 and contacted Rob for a consultation. Although we didn’t list then Rob followed-up regularly, providing important market updates. His common-sense approach, professional marketing and knowledge of the Okanagan Real Estate market played a huge role in achieving our goal of selling our property for fair market value in less than average time. We would recommend Rob to family and friends, buying or selling! “Thank you Rob for agreeing to sell my condo for me, I was very impressed with your efficient professional service offered in a friendly manner. You laid out your terms and the procedures for the sale in an easy to understand format making the whole process easy to understand. As my condo is not a strata building, understanding how the building functions was paramount to promoting to the most suitable market, you took the time to learn how the building is managed and the facilities offered and in doing that you are in my experience the most appropriate Realtor to market condos of this nature and your attention to detail inspires confidence in your proficiency to market and sell all types of properties. I would most certainly use your services in the future should the situation arise and have no hesitation in recommending you as a reliable, professional Realtor to people whether they are selling or buying”. Rob just successfully completed his second sale of a property of mine. As before, he was very good at paying attention to all the small details, as well as listening to my goals and expectations and working towards a successful sale in meeting those goals. Throughout, he pushed my agenda, not his own. And he was very helpful in working through any challenges. I would recommend Rob to any friends or family members, looking to sell a property in that area. "When we met with Rob Marak in the process of choosing a realtor, we instantly felt at ease with him. We didn't feel any of the high-pressure sales tactics we had heard from others. After listing, Rob always personally called to give us plenty of warning for a showing, and followed through immediately with client feedback. Once we signed the paperwork, he didn't leave us in the dark. We always received current market evaluations, and updates of what homes had sold in our area. With that said, I believe the reason Rob stood out as an exceptional Realtor is that he was in fact working for us. He was a man of his word, honest, professional and perhaps of more importance.... he is a man who approaches his work with integrity. He was always approachable. We felt heard when we had questions or concerns, and as a client, we felt genuinely important and valued. Following the sale of our home, Rob has kept in touch on occasion. Should we ever purchase a home in the Kelowna area again, there isn't another Realtor we would want to work with. In our experience, when you are in sales... you must be someone people can feel comfortable with, and trust. Rob has all of that, and more in spades". Rob provided immediate attention to all the questions we posed him during our real estate transaction. Rob is knowledgeable, patient and always the professional. We now have great appreciation for the realtors role and the time that is required to satisfy a prospective home owners wants and needs! We would encourage others to engage Rob in their major lifetime purchase. Rob helped us to get the best price for our apartment by coming up with the pricing strategy and an attractive listing price. He was candid, up front and kept us informed through out the entire process. Rob looked after our best interests and he made the whole listing and sale process simple for us. My parents met Rob when they were looking at selling my grandparents place. They knew I would be looking to sell my condo in the next couple of years so they gave his contact info to me. I got in touch with Rob at that time and we chatted a bit about the market at the time and what I could expect to get for my place. I decided to hold off for a year or two and wait for the market to come up a bit. During that time, Rob stayed in touch with me and sent monthly market updates. This information was vital in helping me decide when the time was right to sell. In late August 2016 he sent me some comparatives and info on the complex my condo was in. I decided it was the right time to sell and Rob immediately got to work. He was extremely helpful in determining a list price that would maximize the sale price as well as sending me the listing contract and doing a title search that very day. He arranged a time with the property manager to view the unit for pictures and the unit was listed very promptly. Showings were arranged almost immediately and we had an accepted offer within 48 hours of it being listed for very near asking price. Rob and his team took care of everything and I had to do nothing except sign the paperwork and sit back and wait for possession. I can’t say enough good things about my experience with Rob. He’s extremely professional and organized. I would not hesitate to use him again and would enthusiastically refer anyone to him who is considering buying or selling. From the initial meeting to the final moments we were in our home, Rob was very thorough, listened to our concerns and did his very best to accommodate them. Rob was also able to refer us to a great partner in the Lower Mainland to help us purchase our new home. We would recommend Rob Marak to anyone looking to buying or selling their property. My husband and I met Rob Marak in Kelowna, BC. We lived in Alberta at the time and we were moving to Kelowna but we were uncertain about the market. Rob quickly put together a profile for us, based on what we were looking for and then gave us his business card and advised we could email or phone him anytime. We went back to Alberta and Rob sent us listings almost daily and then the week before we were coming to Kelowna, we asked him to set up some viewings. We looked at several homes every day for a few days and then on Day 5, Rob found us the perfect home and he put an offer in for us right away. As we were in an unfamiliar city and province, Rob referred us to a Mortgage Broker and provided us with a list of reliable Inspectors and Lawyers. He was a true Advocate! Rob was professional and responded quickly whether by phone, email or text. We couldn't imagine having a more positive experience and recommend Rob without reservation to anyone looking to buy or sell. Thank you Rob! Our experience with Rob Marak was positive from the moment he met with us in Kelowna. We especially appreciated his directness and honesty. Being able to reach him with questions was natural and extremely quick. We were impressed by his rapid response to our communications. We found Rob to be one of the most professional and knowledgeable agents we've ever worked with. He responded to phone messages and/or e-mails almost immediately, regardless of the time of day or day of the week. He always provided excellent feedback. His knowledge and assistance in helping us navigate through the entire process was invaluable. We appreciated Rob’s consistent communication, knowledge of the market and his expertise in handling our purchase. With our limited knowledge of the market in the Kelowna area, we had high expectations for service and Rob was outstanding and we totally appreciated it! Knowing that we had an expert on our side was very comforting. We will and have recommended Rob to folks we know looking to buy or sell in Kelowna and area! We have purchased 2 houses with Rob¹s help, and sold one. We are always impressed with the amount of patience Rob possesses; he provides very good customer service, never pushy and doesn¹t hover over you when you are viewing properties. He is always available to answer any questions, drive us around to tour houses or do some research to help us find the right home. Even after our sales were complete he is still willing to find answers to questions regarding the home and even pick up mail for the previous owners. If you are looking for a realtor who provides good customer service we recommend Rob Marak. We recently purchased a property in Kelowna and were fortunate to find Rob Marak after talking with a number of other local realtors. Over time you learn to recognize when a realtor cares more about their own agenda then yours. Rob isn’t like that. One of the first things that became apparent with Rob is how well he listens. But it didn’t stop there. Rob genuinely cared about our happiness, which is crucial when YOU are spending so much money! We also found Rob to be very patient, accommodating, and helpful…going above and beyond in many instances. But where we felt Rob really excelled was during the negotiations. I personally had a few opportunities to witness Rob represent his other clients and he handled his role professionally, and with simple but very effective tact. We’re usually very careful not to disclose our bottom line to our realtor during negotiations to avoid weakening our bargaining position. But with Rob that was never an issue…because he didn’t pry. Very impressive!! Rob's unflagging good humor and professionalism helped us through months of looking for just the right home in Kelowna. Always cheerful, always patient, and always accessible, he took us through house after house until we finally found one that suited us perfectly. His exceptional attention to detail made the offer go smoothly and when a glitch or two showed up on move-in day, he promptly took care of making it all right. We could not be happier. The level of service Rob provided (always with a smile) was above and beyond our expectations. It was a bonus that we also enjoyed his company! Rob provided us again with stellar service! He was adept in dealing with several challenges that occurred during our condo sale. He is trustworthy and immediately responded to questions or concerns we'd posed to him during the selling process. Thanks, Rob, and to your continued success! Our Realtor in Victoria spent some time to find us just the right person in Kelowna to refer us to and Rob Marak was the Realtor he chose based on his track record and reputation. We worked closely with Rob to find just the right house and in this market that is a challenge. We found Rob to be straightforward, scrupulous, and professional with just the right amount of humour. We will definitely recommend him to anyone we know moving to the Okanagan. Thanks Rob for making our purchase stress free. Rob Marak: You may not have heard this Realtor's name, he does not advertise that he is honest, has Integrity, and will look after all your Real Estate needs, he does not have to, he is and does all of these things, and more. We have known Rob for over two years and that is how long we have been looking for a house in Kelowna that would suit our needs upon retirement. Finally moving from Alberta, Rob was there to help not only with finding a home, but with all the other challenges that come with moving from another province. It was a pleasure to work with Rob, and would not hesitate to recommend him to other people with Real Estate needs. With Rob, and the support of Royal Lepage (Kelowna) you can't go wrong. We wholeheartedly recommend Rob. He knows his market very well. His honesty and integrity stand out. He is unstinting in his efforts to deliver results. In our case, he went over and above what anyone could reasonably have expected to help us arrange our move-out remotely, in a very short space of time. We would be delighted to work with him again in the future. We have purchased personal and investment property in Saskatchewan, Alberta and British Columbia. We found Rob to be the nicest, most conscientious and honest realtor we have ever dealt with. He acted as an excellent mediator on what I would term as difficult negotiations. Throughout the process he was responsive, punctual and articulate. He went above and beyond what was expected. We really appreciated his concern and his ability and determination to resolve any issues that arose. I would not hesitate to recommend Rob to anyone who is looking for a knowledgeable and professional realtor. Dr. Jim and Carolyn I. We can’t thank you enough for your professionalism and integrity in the sale of my dad’s home. It was always fun and a pleasure to deal with you Rob! Your knowledge, good humour and easy going attitude completely made the process of selling my dad’s house as easy and as trouble free as it could be. Rob, you simply made the sale of a difficult to sell house under difficult circumstances easy. As soon as we met you we understood why my dad spoke so highly of you and absolutely insisted that we use you as the Realtor to sell his home after he passed. The compassion you showed when dad first got sick, and called you to take his house off the market during your first listing with him, will never be forgotten. We would not consider using anybody but you should we require a Realtor of our own. We recommend you at the highest level to our family, friends and anyone buying or selling a home! We truly and sincerely thank you for everything Rob! Rob, we can’t thank you enough for all your help with the purchase of our new home. You were a great sport climbing onto roofs and into crawl spaces. We are in love with the place and can’t wait to start some projects! Give a ring next time you’re in the neighbourhood. We’d love to have you over for coffee/lunch/dinner/a quick visit. Thanks again. We would like to tell anyone who needs a realtor to contact Rob Marak of Royal LePage. He is honest and straightforward and you get no fluff from Rob. He will do almost anything for his clients, he even offered to come twice a year and carry my propane tanks up three flights of stairs, which we graciously declined. Rob is a realtor with integrity and we highly recommend him. We are thrilled with our new home. Your patience, honesty and sincere dedication proved to be of great value to us. Your listening skills are incredible. During our conversations you heard every detail of what we desired in a home, and found the perfect one for us. Even after showing us 29 homes you continued to show great interest in finding the home that was right for us. Without hesitation we were shown the same house more than once. You frequently reminded us that the perfect house was out there and we would find it. Once we made a decision, you expertly explained and guided us through the all legal steps to complete the deal. You even recommend an exceptional Notary Public and lawyers for us to choose from. You were highly recommended to me by a co-worker and you have proven yourself to be an exceptional realtor. We will definitely, without hesitation, direct anyone interested in real estate to you. Rob, you treated us like friends, and it was an absolute joy working with you. Thank you, June and John. Rob Marak is a professional, dependable, personable agent who will work extremely hard for his clients to get the “deal done”. We certainly would recommend Rob to anyone who is thinking of of an agent who will always do his best for them. My Wife and I were looking for a condo in Kelowna and were unfamiliar with the area. On the advice of a friend we contacted Rob Marak to assist us with the search. We had only two and a half days and upon arriving at the airport we started right away. Based on initial discussions, Rob sent us many listings that fit our criteria. We immediately began visiting properties and based on our feedback, Rob narrowed the search and focused our visits to properties that best fit our needs. By the end of our visit we were successful in obtaining an accepted offer for our favourite property with excellent terms. Rob was patient and methodical in his approach to find us the right property. We enjoyed working with him and were extremely pleased with the results. We wouldn't hesitate to recommend his services or to use Rob again. 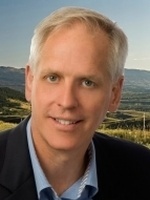 Rob was tenacious and effective in successfully selling our Kelowna residence. He came highly recommended and more than lived up to the recommendations. He consistently went beyond the call of duty and his diligence was appreciated by us as we were infrequent visitors to our former Kelowna home and greatly benefitted from his dedication and persistence. I travelled to Kelowna on a whim to investigate an acreage which just happened to be listed by Rob. I ended up purchasing another that Rob showed me on speculation. During the course of my search, I found Rob to be very professional, knowledgeable, cheerful and patient. He went the extra mile by providing referrals for insurance agents and tradesmen and even hooked up my washing machine. I have been involved in two private real estate sales in the past, and quite frankly private sales are not worth the hassle when there are agents like Rob around. Thanks Rob! We were so happy to find Rob when we were ready to sell. He just "happened" to call at the right time. He proved very approachable with all our questions, and his communication skills were excellent, always giving us feedback on any viewings that we had. We appreciated his honesty and integrity and trusted him to sell our place in a very difficult market. His assistance often went over and above any other realtor we'd worked with. I would definitely recommend him to anyone looking for a realtor, and have already referred him to a friend of mine. We had the pleasure of working with Rob Marak during the summer of 2009 when the housing market was, to say the least, challenging. Rob was tireless in his efforts to find us what we were looking for, which was no simple task. He made sure that our offers were sound and that we knew what was relative to whichever property we were looking at. We really felt that he had our best interests at the forefront of any negotiations. We ended up with a property that met all of our expectations and we got it for a far better price than we could have hoped for. Rob made sure that all of the details were addressed and that our deal was secure. We could not have expected more from a realtor than what Rob delivered. We would have no hesitations recommending Rob Marak to anyone who is either buying or selling. Thank you for your skill and effort in negotiating this deal. I am happy, stunned, and excited. I am sure I will be very happy in my new home. I like it already and I am not even living there yet. Thank you for your good wishes. I really appreciate the way you guided me through the whole process of selling and buying a home, and should the opportunity arise, I would certainly be happy to refer you. I would like to express my gratitude for your expertise and support throughout the process of selling my home and purchasing my new home. I appreciated the regular market updates and the feedback on the showings of my home. Thank you sooo much for everything! Pat moved in and the house is immaculate- what a nice surprise and a relief even the blinds were cleaned. I'm impressed -the seller did such a nice job - If there is someway to thank her - could you do that or could we? As well, thank you very much (big time) for what you did for Pat (and myself). You have an amazing amount of patience - I bet you thought the hunt would not end sometimes! I speak for Pat here but the house feels like home - he is very pleased, and I didn't want to go back to my house after I got him settled - I want to move in! Thank you for the Starbucks and the lock changing - I cannot tell you enough my appreciation. You must really like your job because you are very good at it and you’re a nice, real and neat person. You have definitely earned our loyalty for as long as you want it! Kimberly D. and Patrick M.
Having lived in the same home for 34 years, the process of moving across the country and buying a new home was quite a challenge. Rob made the experience less stressful by his expertise and professionalism. His superior knowledge of the Kelowna real estate housing market proved invaluable. Thanks Rob for all your help. You made my move a fun and successful journey.